Hey, who wants some coffee-flavored potato chips?! Who's with me? Anybody? On Tuesday, Lays released the four finalists for their next potato chip flavor. The winner will, as last year, be chosen by fan vote. You may remember this contest from last year, when Cheesy Garlic Bread beat out Sriracha and Chicken and Waffle to become a permanent Lays flavor. This year, one of the flavors is Cappuccino, which totally makes sense. If there's one thing I've always felt about steamed milk and coffee drinks, its that they'd be so much better in crunchy potato form. The really goofy thing here is that three out of the four flavors sound AMAZING. Mango Salsa? YES. Cheddar Bacon Mac and Cheese? Holy crap, give it me now. Wasabi Ginger? That sounds so delicious it feels like it's cheating. 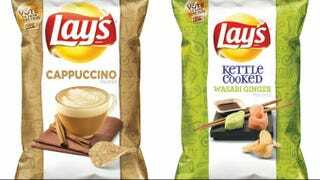 Given all that, though, I'm sure Cappuccino will win, because we can't ever have nice things (RIP Chicken and Waffle chips). Way to try to be edgy, Lays, but you're still not touching your inter-company competition's level of bananatown. Also, because one person has already asked: ABSOLUTELY I will do a taste-test of these and write about it for you, because that's just how much I care (and how much I love potato chips). Stay tuned.